As the economy has recovered, America’s next financial crisis in my opinion will be that of student loan debt. Student loan debt is some of the worst debt a person can have. 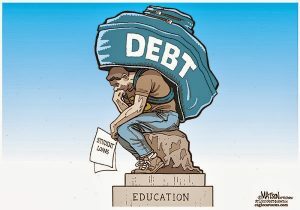 Most bankruptcy lawyers will tell you that a debtor is generally not allowed to discharge student loan debt in a bankruptcy barring a showing of significant undue hardship, usually for medical reasons as to why the debtor cannot pay back the student loans. Additionally, parents or relatives who co-signed for student loan of a now deceased individual may be liable for the debt if the loans were private student loans rather than federal student loans. For more information on the subject check out this article on student loan debt in a bankruptcy. If you are somebody who feels that you cannot make any payments on your student loans due to not being able to work, you may consider attempting to discharge your student loans. This is done by filing an “adversary case” in addition to your bankruptcy filing. Basically you are suing your student loan lender in order to get an order from a bankruptcy judge that says you can discharge your student loans. Often times you will have to endure a trial which can be be time consuming and costly as most attorneys will not take on an adversary case pro bono (for free). While debtors who have significant private student loan debt may be out of options, debtors who have federal student loans may be in luck as there are several federal programs which allow borrowers to manage their student loans. One of these programs is called Income Based Repayment. Under income based repayment you only have to pay a small percentage of your income towards student loans. Also if you income is $0 then you don’t have to make any payments. Also if you make your payments for 20-25 years, you will receive a discharge of your debts at that time. If you have additional questions regarding discharging your student loans please call Symmes Law Group at 206-682-7975 to set up your free consultation. ‹ Is My LLC Safe in Bankruptcy?